When you buy ammunition, you want it to be effective but you also want it at an affordable price. Federal has been providing both of those options since their founding in 1922. 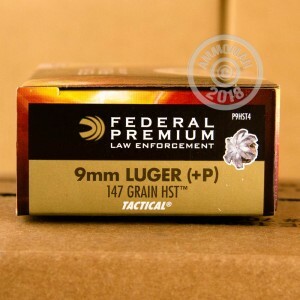 With the high quality of these Federal Premium Law Enforcement rounds, you can make sure you have the best rounds in your firearm for self defense. The 9mm Luger came out in 1902 and has become one of the most popular rounds in the world, used in countries all over the globe. 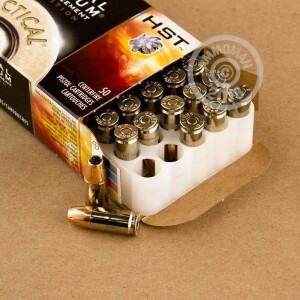 These 147 grain, HST jacketed hollow point rounds from Federal Premium offer the power, expansion, and penetration you need to stop an assailant. 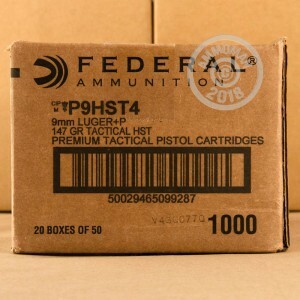 With these 9mm Luger +P rounds from Federal Premium, you have some of the most reliable and consistent rounds that Federal offers. Good News, at AmmoMan.com all orders over $99 ship for FREE! So order this case today and the shipping is on us!